Your hero lives quite a grim life, either under the guardianship of a grotesque Dahl-inspired uncle or an abusive stepfather. Later we learn that, in a perverse way, he is actually here for his own protection. Your hero is an unlikely hero inasmuch as he learns very suddenly, and very quickly, about his true parentage when he is thrust into a new and very magical world. Your hero has two best friends, a boy and a girl. There is some initial love interest with the girl, who is quite feisty. In a further instalment the hero and best male friend may quarrel over the girl. The magical world is entered via a secret gateway not accessible to normal humans. This could either appear in the form of an extra station platform or, erm, a not particularly secret looking gateway. The magical world focuses on training our heros, either in the form of a school, or an open air camp where you can do archery and stuff. A bit like Centerparcs. a wise, big-bearded, authoritative figure oversees our hero and his gang. Richard Harris is the model although Michael Gambon will do. Pierce Brosnan will also do. The director Chris Columbus will do. And so on. Rick Riordan’s Percy Jackson has an advantage over Harry Potter in that it weaves Greek mythology into its universe, this giving the opportunity to use recognisable stories (whereas Rowling writes herself into a corner where she is forced to invent everything from scratch). Percy Jackson and the Lightning Thief features a host of Greek Gods played by English actors, including Sean Bean (Zeus) and Steve Coogan (Hades) and a good share of mythological monsters, the best of these being Medusa (played rather well by Uma Thurman). 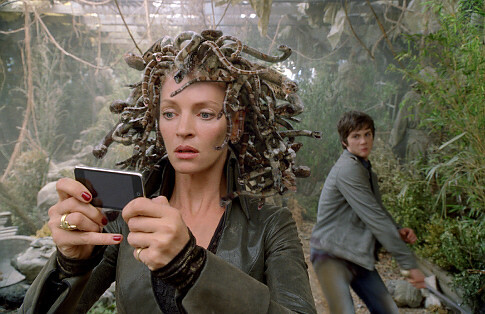 The film gives an excellent take on the Medusa tale with Percy using the back of his iPhone to deflect the deadly gaze of the serpent-headed one. Similarly, the story of the Lotus Eaters receives a modern treatment when the gang go to Las Vegas. Percy Jackson and the Lightning Thief is driven by an obvious plot that is nevertheless still enjoyable. Percy’s mum is kidnapped by Hades, he must travel to the Underworld to rescue her but must first find three pearls that will get him and his friends back safely. There’s an obvious villain, and so on. Where this film doesn’t have an advantage over Harry Potter is in that is rather too cynical in taking up the Hogwarts Formula module. There aren’t enough strong supporting players (no equivalent Hagrid or Snape, for example) and, whatever you think about Harry Potter, it does have buckets of enviable charm which is beyond any formulaic approach. I admit to being a little cynical about modern films for children. This is possibly because I resent the recently introduced commandment “thou must take your kids to see anything with computer animated talking animals”. There now appears to be a further legislation stating that everyone must attend at least one screening of every new Pixar release. At least this was the outlook yesterday afternoon when we decided to see Up. Thinking we could simply breeze into the feature of our choice at our local multiplex I was shocked to be informed by a smirking lad at the ticket booth that Up 3D was completely sold out. I was advised that we could either wait three hours (an eternity in kid time) for the next 3D showing or one hour for the next 2D version. I could see in the eyes of the smirking lad at the ticket booth that he saw 2D as seedy, scummy, not even worth bothering with. But we plumped for 2D, mainly because I’m becoming increasingly tired with the recent obsession with 3D films, especially those made by Disney/Pixar. I do not think that 3D makes a good movie, and in some cases – such as the excellent Coraline – 3D can actually spoil a film. But the hour’s wait for Up 2D was unpleasant. Joining a line of people conveniently placed beside the pick and mix counter, being informed that we were in the wrong line but that it didn’t really matter, learning that our “VIP” tickets would get us into “the theater” first but only after forming an additional, but more select, queue. And so on. Why did I buy “VIP” seating? I don’t know. It appeared to only offer one comfort, which was in the leather backed chairs successfully muffling the heavy kicking from the brats sitting behind us. Now I’ve got all of the extremely nasty preamble out of my system I can report that Up is a very enjoyable film. Perhaps it is because I could identify with the lead character, a grumpy, curmudgeonly 78 year old. 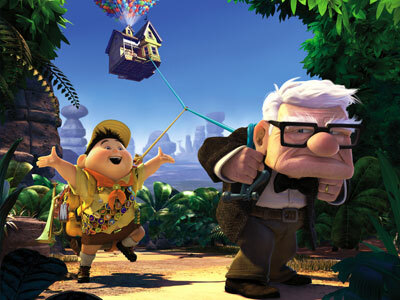 Up is unusual in that it takes a old person as a lead, although Pixar cannot resist a cute kid and the obligatory talking animals. What makes it – and I’m sorry I cannot resist this – rise above the usual type of children’s film is both extraordinary attention to detail and emotional depth of the story. That Up is at times very moving is best proven early in the movie when the life of our elderly hero (Carl, voiced magnificently by Ed Asner) is told in a quick succession of silent scenes; his marriage to Ellie, hopes for a life of adventure slowly ebbing away as they grow old, Ellie’s death. It’s a quite beautiful moment in cinema. Carl, who’s an ex balloon vendor, faces eviction from his lifelong home. Not a startlingly original premise for a film, but here the hero decides to escape the inevitable by floating his house away with the help of hundreds of helium balloons. He meets a stowaway called Russell (our cute kid) and together they head for South America. Here the film shifts from a visual treat of airborne scenes to the more mundane premise of another talking animal film when the two meet a speaking dog. However, Up manages to inject some originality into proceedings by making the talking dog and his canine associates rather wonderful creations (the difference is that they’re very funny and have fittingly animal characteristics – saying things like “a ball! Please throw the ball! I will run after it and bring it back!” in the eager to please way that dogs have). The makers of Up have forced a simple plot to fit over the film’s finer subtleties, which could be seen as pressure to please the universal audience. It features a baddie (Christopher Plummer) with a longtime obsession to catch an emu like bird (who just happens to have befriended Carl and Russell). It’s to their credit that they manage to save the film from silliness. Plummer makes a fine villain and the resulting chase scenes are immense fun. Only once, where Carl’s house is hunted down by dog-piloted biplanes, did I bark gruffly that this was cynically inserted to benefit the 3D effects. There are moments in Up that will go – I’m sorry about this – over the heads of the very young. I took it that the message of the film was how Carl believes his life to be wasted and that he’s missed adventure and excitement, only to realise that the most ordinary of lives is an adventure in itself. This is a concept a little too mature for the very young, at least the ones surrounding me yesterday. For this reason they will remember the funny dogs the most. Then this will fade and perhaps they’ll only recall the strange flying house. Quite often I judge the enduring appeal of a film by how long we discuss it on our 20 minute drive home. Although agreeing that Up was a sweet film, sad in places, with my ten year old and that the talking animals were far above average we soon lapsed into silence. I enjoyed Up a great deal but I suspect that it really isn’t a great movie; it’s an inoffensive, above average and well made film. In the crowded market of children’s entertainment that’s still something of an achievement. The latest instalment in the Harry Potter series is the best so far. It’s a film of great quality, lovingly made by director David Yates and featuring the level of excellence that you would expect in acting, script and, most impressively, set design. As usual, the familiar cast return, and whilst regulars Michael Gambon, Alan Rickman and Maggie Smith appear only to have gained a wrinkle or two, youngsters Radcliffe, Grint, Watson and all their Hogwarts classmates have indeed – as us oldies are want to remark – shot up. 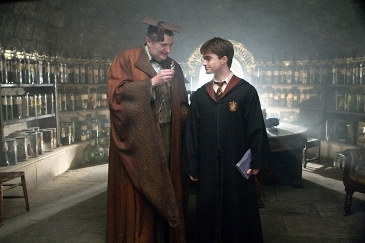 The cast also gains a brilliant addition in the great Jim Broadbent, outstanding as the doddery yet potentially dangerous Professor Slughorn. At two and a half hours, Harry Potter and the Half-Blood Prince takes its time to unfold, and whilst the more talky sections may give the younger viewer reason to fidget, I found the gentle progression of the film most welcome. Following a great visual opening scene it soon settles into the character development of our three leads. Easily outgrowing their Hogwarts gowns (there’s a scene where Harry and Ron in their pyjamea doesn’t really wash), they are seen busy discovering their emotions and hormones; Ron is pursued by the dopey Lavender Brown whilst Harry begins to fall for Ginny. Hermione, of course, begins to develop feelings for Ron. It’s all handled very well, and with great humour, although again possibly of little interest to the younger fan. What’s best though is the wonderful visual sweep of the film, where it remains something quite beautiful to look at from beginning to end. Fred and George’s dream come true of an amazing joke shop, the inevitable game of Quidditch, Harry’s journeys into the pensieve, Slughorn’s classroom of strange vials and potions, the Weasley home of many strange angles – all are brilliantly constructed scenes. The Half-Blood Prince is made with care and is forever intricate, a film full of deliberate and satisfying detail. The actors, and especially Broadbent, shine more here than ever before. Thankfully we lose the irritating Durlsey scenes, and many quality actors, for example Timothy Spall and David Thewlis, are reduced to little more than glorified cameos. But again, in a film of such quality, a blink-and-you’ll-miss-it appearance of Timothy Spall can be afforded. If I have one criticism it is that Michael Gambon doesn’t quite hit the spot for me as Dumbledore. There’s a hint of Irish in his voice, possibly a nod to the late Richard Harris, and it’s a shame that Harris didn’t live on to continue his run as Albus, as I found him superb in the earlier outings. But what of the plot? 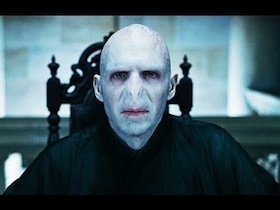 Unlike most Potters, which tend to build up to the return of Voldemort in some shape or form (most memorably personified by Ralph Fiennes), this chapter falls back to the early life of the Dark Lord. I always found the novels frustrating in that, over seven increasingly longer volumes, they didn’t reveal nearly enough about him. This film is equally teasing, and non-Potter fans will no doubt comment that it’s inconsequential. But a counter argument is that it’s a different kind of cinema, a series of interlinked films that defy idly dipping in and out of. The ending, just like the book, is particularly downbeat. Don’t expect to come away with all of the answers. Harry Potter and the Half-Blood Prince is a 12A, a certificate I would agree with as my ten year old daughter did find some of the scenes quite terrifying. In particular, where Harry and Dumbledore cross a dark cavernous lake to begin the quest for Voldermort’s horcruxes. It made me, and the strapping bloke in the seat behind me, jump for our lives. So I have come away from the latest Harry Potter loving it because, in many ways, it has become – like Doctor Who – something almost beyond too much criticism. Skilfully made, enjoyable, popular culture. And if I compare this to the films made for children in the 70s there is no comparison. It certainly sets the standard very high.